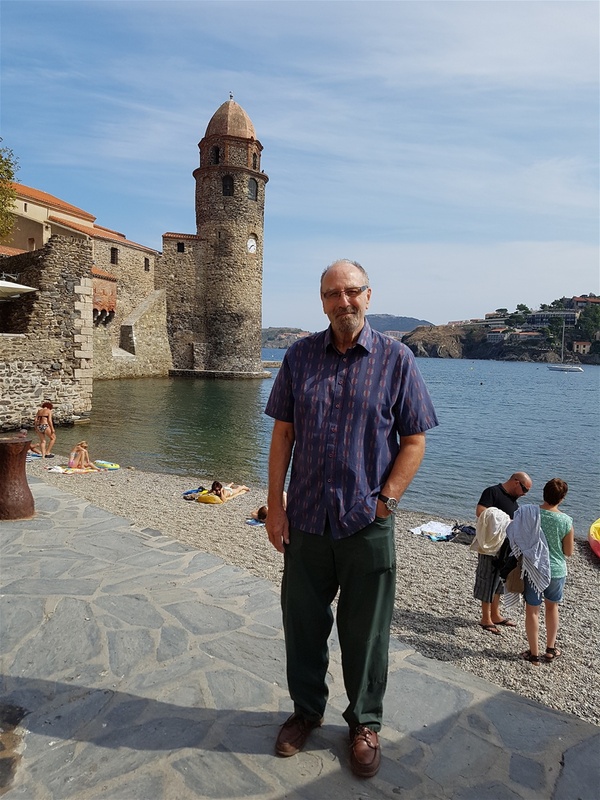 Collioure on a typical day. Blue sky, shining sea, glorious light. 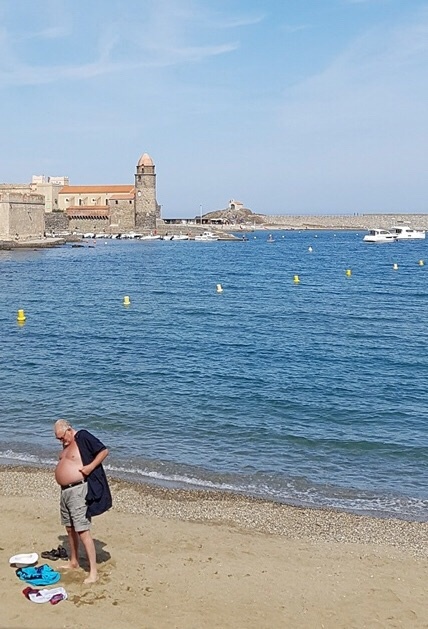 Collioure the Magnificent. Not just for artists. Marigold here. Am still covered in bites, whether they are mosquitoes or fleas from the itchy B and B. Am so dopey from antihistamine tablets am travelling round in a twilight world and having weird dreams. G seems very happy with me in this state! Loved Collioure as much as every other time. The hotel we stayed in was a bit out f town, so cheap not madly expensive, but means paying the Earth to park the car, oh well. It was run like an army camp with rigid rules. The help yourself buffet breakfast was overseen by a blond haired harridan who watched how much you put on your plate. No good for us as we wanted to pilfer some for lunch. She had a dickey fit as we took a tray ready made up which she said was for room service. Well, we could have been going back to bed. Have given her a vile review, so she will be sacked immediately and have to get a job in the fish market, selling fish heads. Corbiere again fab. Loved the little arty shops where they make pretty things to buy. They seem obsessed with natural soaps which don't smell very natural. One smelled like toilet cleaner and another one was mint soap. Just imagine. G won't go in to these shops as the smell is too much. Saw a woman selling kittens and was very tempted. There don't seem as many tattooed people around, maybe yet to happen around here. Hope it never does. Over to G now to tell you all about Collioure. 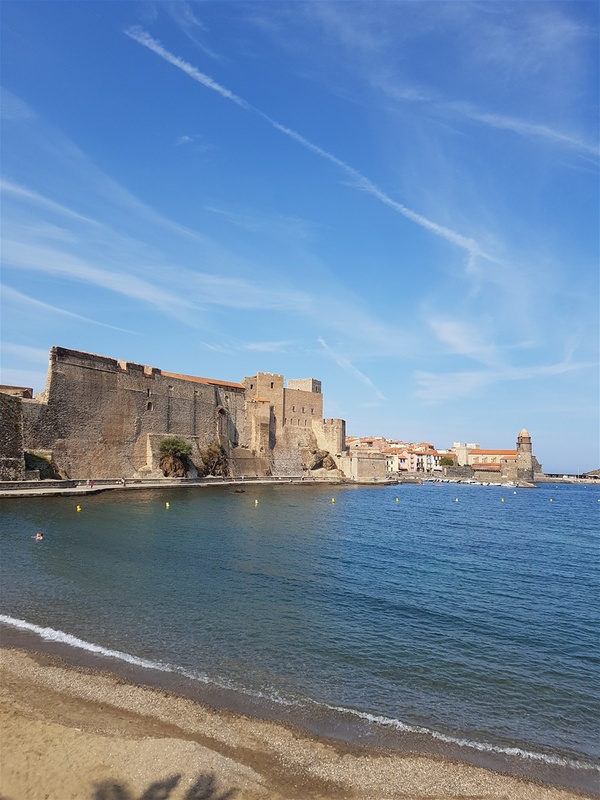 Collioure is the jewel of the southwest coast of France, the St Tropez of the Languedoc, and we’d live here all year round if we could afford it. Property prices are high, very high, parking the car is a nightmare and the place is crammed with tourists. Despite all, it’s a town we return to time and again. We remark on the mutual impression that the ‘anchovy buildings’ look to be a less vibrant shade of pink than we remember. There are now just two ‘shops,’ remaining: Ets Rogue and Ets Desclaux. We have been inside the buildings, a treat for anchovy loving friends, in the past and can remember with awe the precision of the work. Anchovies are filleted, quite a task in itself, cleaned, packed in salt and finally arranged in their tins ready to be labelled and sent off to customers all over France and further afield. Fiddly work and I wonder why they bother. Marigold loves ‘em so she has a very different view. We find a spot for the car, after a struggle, in full sun and at ridiculous cost (will never complain about car park prices in Cornwall ever again) and stroll past the vast fortress that is most people’s first view of the town. We’re heading for the quayside, but detour, as we always do, through the warren of narrow streets, buy a pair of ear rings from a lady who makes jewellery with a dexterity that would be the envy of an anchovy packer and finally reach what must be the most painted (by artists, not painters and decorators) and most photographed church in France. A hen party, the wife-to-be dressed as a mermaid, are hobbling along in front of us, all doubtless wishing they’d worn less vertiginous shoes on the uneven cobbles. They’re in good spirits, happy and relaxed so we smile at their antics like everyone else. They rush across to tease a young man behind the ice cream stand and we get to study the various artists’ attempts to follow in the footsteps of the Greats by capturing this familiar view of the church set in the harbour on canvas. Matisse can rest easy, we decide. 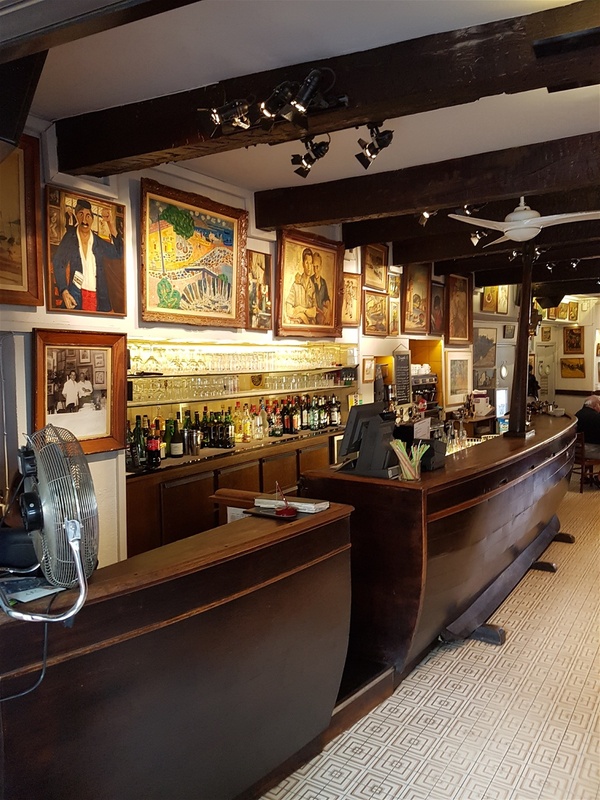 We decide lunch can wait as the quayside cafes are best left for special occasions and carry on to the legendary Hotel des Templiers, the artists’ bar of Collioure. 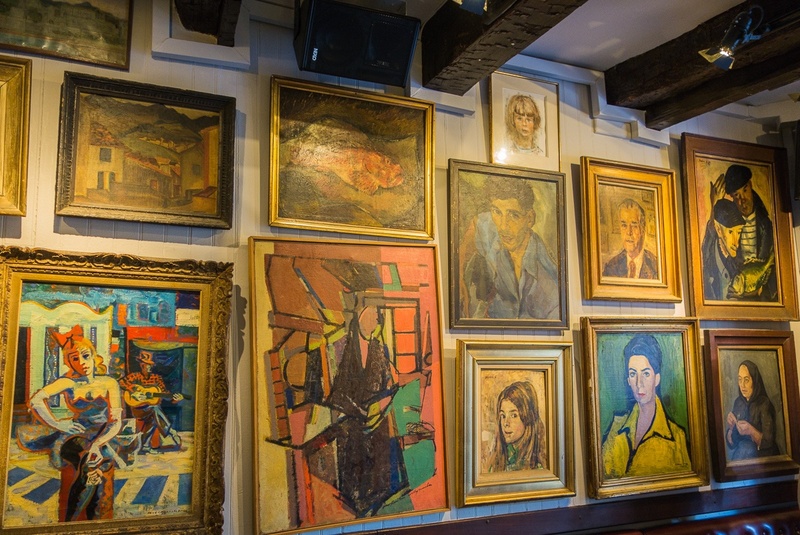 Matisse, Maillol, Dalí, Picasso, and Dufy used to drink here and the legend has grown up over the years of these great artists donating a picture in lieu of paying their bar bills. The walls are crammed with pictures and there as many as 2,500 in total, spread throughout the building. When we lived locally this bar was a must-see place to take visitors and the owner, Jojo if I remember correctly, once took me on a personal tour. Never seen so many pictures in one place before or since. The bar itself is long, dark and made from the hull of a boat with a mermaid sculpture thrown in. Inside, it’s dark, almost gloomy, but blissfully cool after the heat of the noon sun. 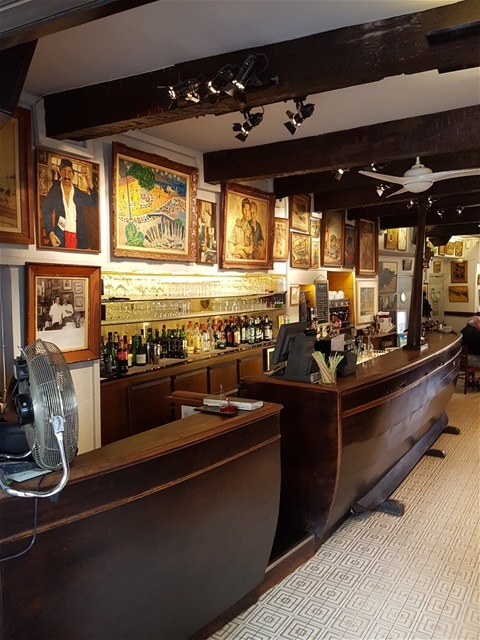 No sign of Jojo, so we settle ourselves down, sip our drinks, beer and Pastis if you really want to know, and just stare at the walls. How much are all these canvases worth? It defies belief. An old man with a very old dog engages us in conversation. Actually, it’s Marigold he wants to talk to, but his accent and eighty-odd years of cigarettes force her to seek my help. ‘Thanks very much,’ I mutter, but it turns out the old man makes more sense after a while and he wants to tell us about the old days. 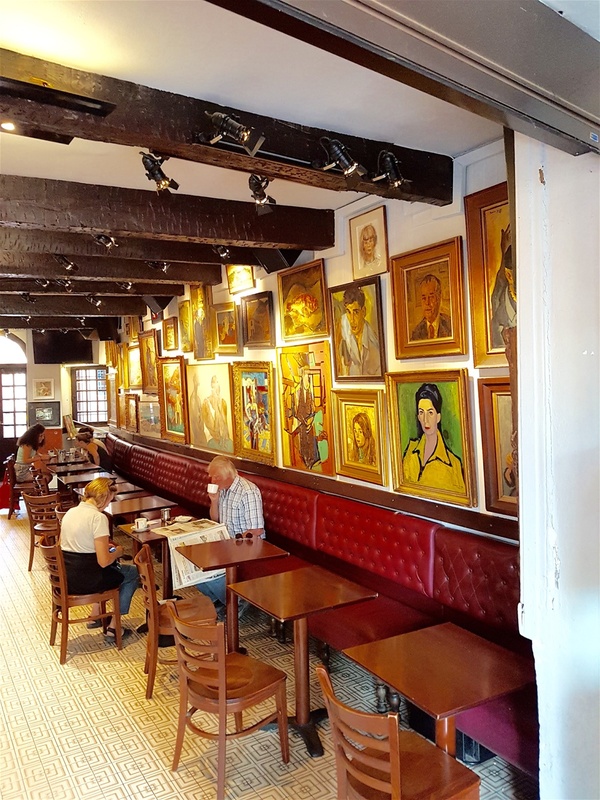 Marcel, our new friend, told me he had been a customer in this bar since he was a boy and his only regret was an inability to paint as the odd picture would have been helpful when settling his bar bill. I bought him a vin rouge to go with the five empty glasses already on his table and as we left he was ordering another. Maybe art lessons would have been a good idea. 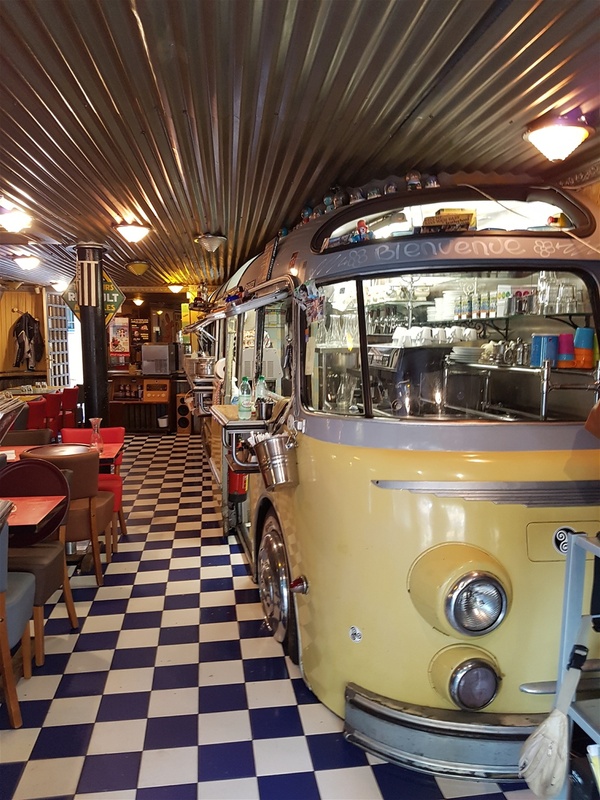 Just along the quayside is a very different establishment: a café with the serving and food preparation areas being housed inside a cutaway camper van. I asked permission to take a photo. ‘Bien sur’, of course, the owner said and offered us both a slice of cake and a biscuit to munch on as we passed by. Don’t get that in Macdonalds! Across the road from where we left the car, locals are dancing the Sardana with great seriousness. It may not look it, but there are rules to be followed and woe betide the visitor who joins in hoping to pick it up as they go along. Frivolity is discouraged here and in nearby Ceret where the national dance of Catalonia is concerned. There’s a statue of dancers performing the Sardana in Barcelona, just about the only item in the whole city not to have graffiti attached. It’s that serious. We watch for a while and move on. At festival time the dancing is exotic and joyful, but today it is all studied precision. We must move on soon, perhaps tomorrow, but our favourite segment of France has delivered once again with many memories to take with us on our way. How much is that lot worth? Very different to Hotel des Templiers, but almost next door. One man and his dog, siesta time.